After I don't know how many months, we visited with my mother. She's still in the rehabilitation hospital and doing better. She's still on IV antibiotics but I believe she's on her way to healing the abscess. Diverticulitis is no joke and she was really out of it when she went to the original hospital. For instance, she thought my brother Brad was the one who brought her there. No, that was Rob. Speaking of brothers, my other brother Eriks came to Ionia for a visit a few weeks back but no one told me so I didn't get to see him. Not that our calendar would have necessarily allowed, but it would have been nice to know. I do wonder what will happen when my mother dies. She's my main connection to the family and I wonder if I will have any sort of relationship with my brothers and sister after she's gone. I'm a half-sister to all of them and didn't know they existed until I found my mother in 1994. I was 34 at the time and all of them were also adults and living their own lives. As we live three hours away, the only time I'd see them was when we'd come to town for the holidays or other family events. I am not particularly close to any of them, nor my nephews or nieces, or cousins for that matter. I am also not close with my adoptive brother and sister or my adoptive family step-sisters, and I wonder how much of that is due to having been adopted and just not having had whatever is that leads to feeling emotionally close to someone. I love my husband but I don't think he has any idea of what's going on inside my head 95% of the time. Nor do I understand how it feels to be him as concerning his immediate family. He loves them and talks with them frequently, each at least once a week and sometimes much more. Me, I'll call my mom every few weeks and I have never called any of my siblings just to chat. In any of my families. I think I'm broken and so used to be broken that being broken doesn't bother me 99% of the time. On the other hand, if I lost all of you, my LJ and DW family, I'd be lonely and sorrowful. Anyway, back to seeing my mom. Her spirits are pretty good, her short-term memory is much better than it was after her stroke but is still problematic. We repeatedly had to correct her that we're in September not August, and that next month is October, not September. 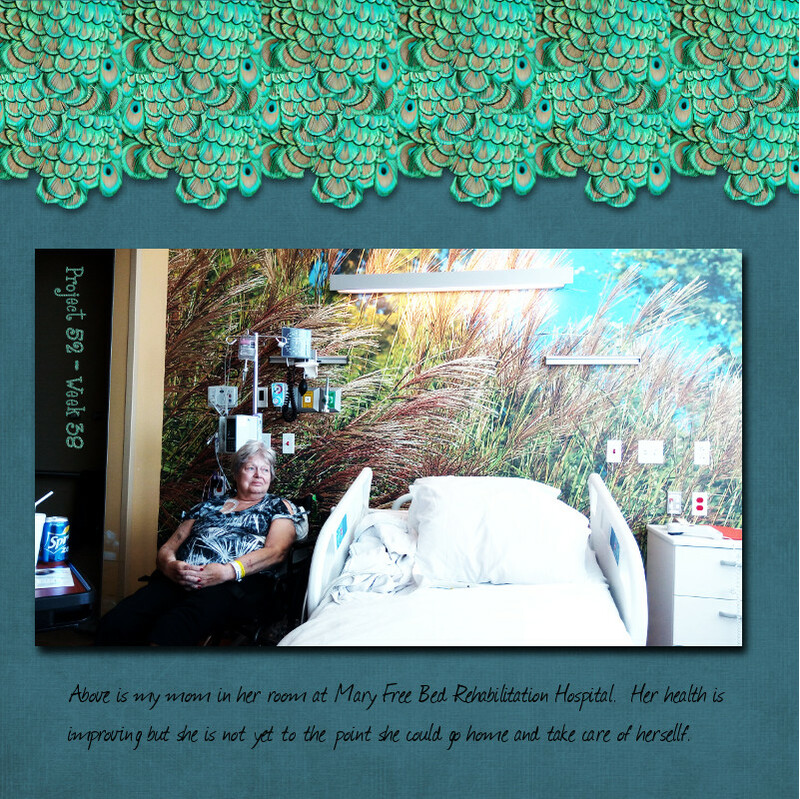 She has no idea when she'll be released from Mary Free Bed and that frustrates her. What worries me is within minutes she'll switch between thinking she'd be fine at home alone to saying that she needs help doing even basic things, like getting up out of a chair, or getting in and out of the bathroom. She hasn't lost all hope for the future though, and she's going three hours of physical therapy each day, so she is getting stronger and the abscess is healing. The only other major thing this week was our Saturday, in which we got up and did things in the yard. This was the first time we'd worked on it all year and we estimate we got through 1/5 of the job. That fifth filled five yard-waste bags with enough vines and branches on the ground to fill at least one more. I was exhausted and sore and it was getting close to being dark when I called it night. We'd talked about doing more tonight but I don't know if that will happen as we need to go to the grocery store and there won't be time to go tomorrow. Hope all of you are well and happy, and as ever, if you have questions or want to make a comment about anything, do so. This entry was originally posted at https://mrs-sweetpeach.dreamwidth.org/982086.html.